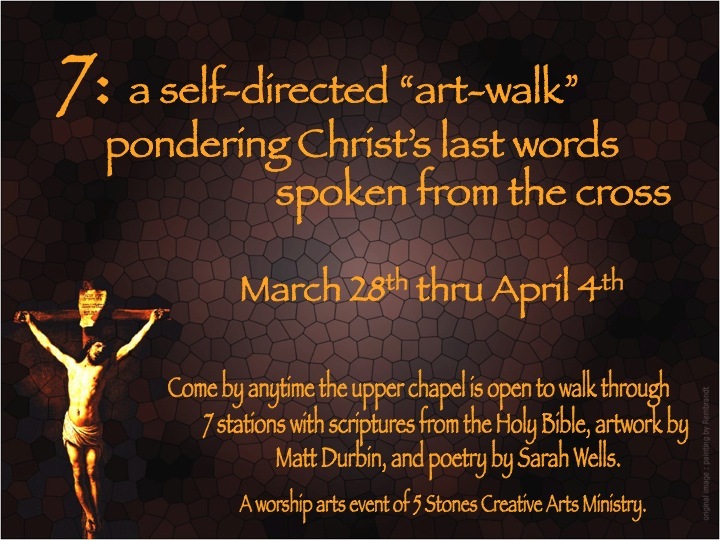 Several years ago our church creative arts ministry offered an event called “7” — a self-directed art-walk focusing on the last seven words of Christ spoken from the cross. Similar to a prayer-walk, an art-work utilizes art to help you prayerfully meditate while walking through a series of stations. There were seven stations and at each was a banner with the words of Christ, a poem by author and poet Sarah M. Wells, and a painting by artist Matt Durbin. We will be re-creating a “virtual” version of “7” through the Create-A-Day posts with poetry by Sarah and artwork by Matt paired with songs. Our hope is that these posts will prepare your hearts for Resurrection Sunday, help you consider the cost of Christ’s priceless gift, and worship Jesus more deeply during this blessed season. Banners: We borrowed these amazing banners (pictured left, above and below) painted by another church’s creative arts ministry under the direction of artist Mark Burleigh. 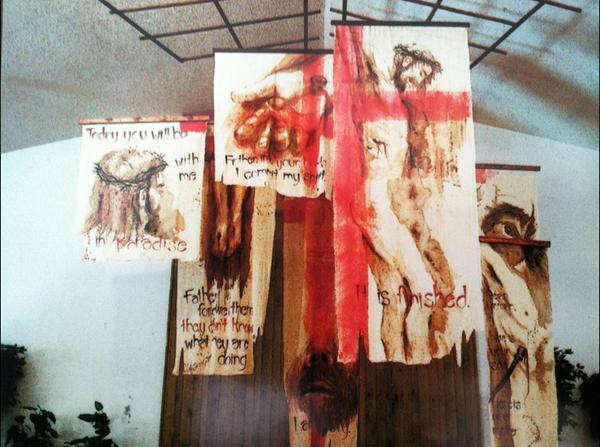 Using earth-toned paint with a splash of red on muslin fabric, the artists painted images of Jesus’ face, hands, feet, etc. accompanied by the scriptures of the last words of Christ. They were gracious enough to let us borrow them. Poetry: Sarah is a poet and writer that attended our church and was part of our creative arts ministry. I gave her the seven passages and challenged her to create a poem for each. Her words later challenged me as they caused me to ponder much more deeply the words that Christ spoke. Encourage a writer in your church or ministry to do the same. 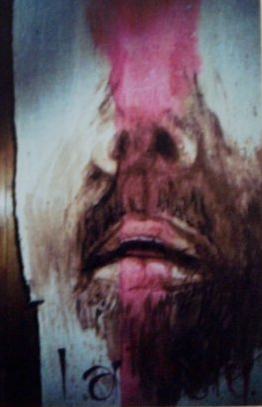 Artwork: Matt was a senior art major at Ashland University at that time. He had painted on several occasions during our church services so we used those paintings, as well as others he had painted for school projects and his senior exhibition. 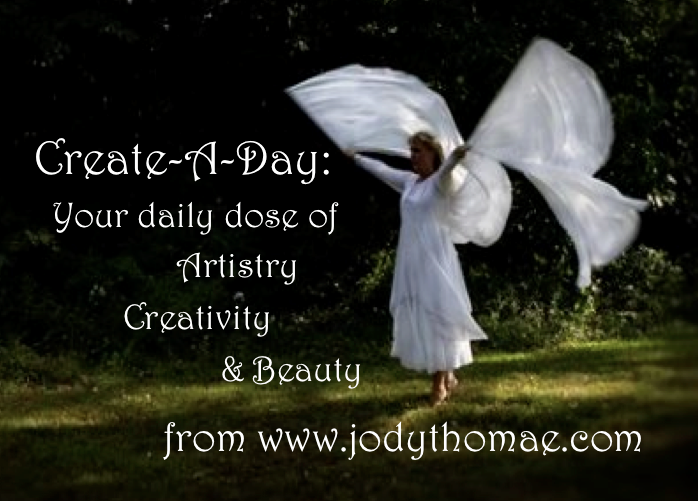 Again, encouraging an artist (or artists) to create pieces related to these scriptures can be equally challenging for the artist and for those who view their work. Promo: below is the flyer we used to promote the event. Logistics: The art-walk was set up in a part of our chapel that could be accessed throughout the day and evening so the art-walk was available whenever the chapel was open. We had recorded music playing and battery operated candles “burning” to create a sense of a sacred space. Even though it was fairly self-explanatory, there were directions near the entrance. We also placed a journal at the end so people could sign it like a guest book and share their thoughts. We had it set up from Palm Sunday through Easter Sunday. Should you have any other questions, please feel free to comment below. I pray that as we venture through the days leading up to Resurrection Sunday you yourself will be challenged to ponder more deeply the words spoken by Jesus as he hung on the cross, and that those words will change both how you live and how you worship.